This article is part of our Holiday Reads 2013 series. Remarkable Creatures is Rosanna Ley’s recommendation. Quercus published her book, Bay of Secrets on May 9th, 2013. You can read our review of the book here. This is a perfect holiday read for anyone who loves the Jurassic coast of Dorset as much as I do. 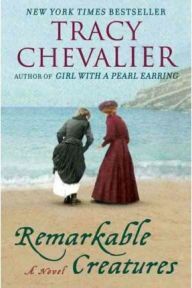 The novel is set in Lyme Regis in the earlyish 1800s and the limelight of point of view is shared by the young, working-class girl Mary Anning and an educated but down at heel spinster Elizabeth Philpott. Both characters are real people with an interesting story to tell. Mary Anning survived being struck by lightning as a baby and this event has given her ‘the eye,’ meaning that she can spot fossils she calls ‘curies’ on the beaches of Lyme Bay.